With so many home security systems today, don’t you think they all look the same by now? Well, not if you’ve been bagging the GE Liberty Award for three consecutive years like Pinnacle Security. It belongs to America’s fastest growing companies and even became recommended for a state’s Best in Merchandising as well as for a Consumer Services Award. Pinnacle Home Security System mainly relies on the General Electric brand for its devices. It has Alarm.com to automate your home through its own mobile app . Pinnacle Home Security secures your home with its three layers of protection. 1. From the outside, Pinnacle Security imposes its first layer of protection by its yard signs and decals. How does this protect your home? Visual warnings, such as a yard sign, often discourages burglars by letting them know that a security system is monitoring the perimeter. 2. The second layer is made up of your entry sensors as well as your glass break detectors. If a burglar decides to enter your home, tripping the alarm should scare them off. 3. However, if he gets past the sensors, the intruder alarm and the motion sensors will be your system’s last line of defense. It relies on both phone and cellular technology in relaying your signals. You can control your system through your smartphone, a tablet or even a web browser. It is only available through professional installation. Pinnacle can process your installation on the same day that you requested for it. It also offers relocation services. In case you decide to transfer to a new home, Pinnacle gives its relocation service for free without locking you to another contract. Pinnacle also provides business security. It has 3 monitoring centers to provide you with 24/7 professional monitoring. Pinnacle offers a two way talk feature. As communication is vital especially on emergency situations, talking and being able to communicate with your monitoring station can increase not only their response time but it can also better equip them when they respond to your situation. Worrying over your old system? You might as well not overthink on spending on a new set of security devices. Pinnacle has a translator to link your old devices with the new ones. The translator works in the same way as a human interpreter. The only difference is that it translates your old system’s wired signals to wireless ones. It even lets you use up to eight zones of your wired system. Aside from the translator, Pinnacle also offers one unique equipment that might separate it from the rest. It has a unique image sensor. How different is it? The Pinnacle image sensor can detect a movement even if it is 35 feet away. Simultaneous with its detection , the sensor takes still-shots of the movement through its built-in camera and then sends them over for you to see. Pinnacle Security allows you to build your own package. Since they have the GE brand for their devices, the choices are relatively great. To give you an idea of their starter set, Pinnacle has the Essential Package. Other than the Essential Package, Pinnacle also has other packages pre-assembled for your needs. All set comes with the free mobile app. Each package has a monthly fee ranging from $34.99- $49.99 while total installation fees vary for each. All of the packages don’t require you to hand out upfront payments. However, you may be required to sign up with a standard locked in contract of 3.5 years for each set. If you decide to cancel, you may be asked to pay them back. As for relocation, policies vary with time. Say for example, you decide to move after 1 contracted year. Pinnacle will not charge you for any installation fee. However, you may have to sign in to another contract. If you decide to transfer to a new home with less than 1 contracted year, you may not sign on another contract. However, you may have to pay $99 for your system’s installation. Pinnacle Home Security System has several packages which you can choose from. However, you also have the freedom to create your own. Pinnacle has a “translator” for converting your device’s wired signals to wireless. It saves you money from buying new equipments. It has a unique image sensor. Pinnacle Security keeps your home safe by three layers of protection. Pinnacle is an exclusive GE partner. The range of compatible devices by the brand gives you more freedom in setting up your system. There is no upfront payment for the devices but you may be required to pay a cancellation fee if you decide to quit their services. Each package has a 3.5 year contract that applies. It can only be installed by a professional technician. Pinnacle can process your system’s installation in the same day that you requested. All equipments are covered by a lifetime warranty. 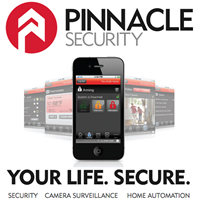 Pinnacle Home Security System will no longer be able to provide you security services as it is already out of business. They have been reported to sell their accounts and technology to other security systems such as SAFE Security, Protection 1 and ADT. This review will no longer be updated and maintained. On the same note, we advise you to review other home security systems that can fit your need. You can view our Top Ten Home Security Systems to get a better idea.